During the brutal cold snap we had around New Years, there was one day that was a balmy -15C. A perfect day to go camping in the woods. The quinzee on Caribou Lake. I have never gone winter camping before, in fact I have barely gone summer camping before. Having a grown up with a cottage on Star Lake, I never really thought to go camping. Holidays and vacation time were spent hanging out on the dock and the boathouse. 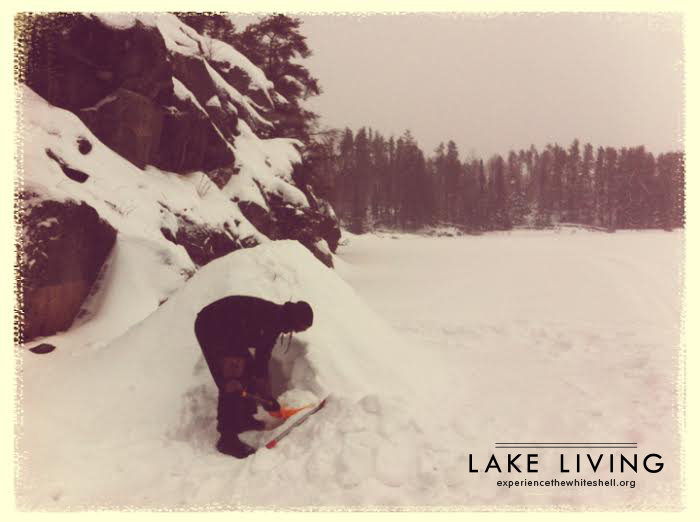 So this winter camping trip to Caribou Lake was a great new adventure for me. Caribou Lake is an isolated little lake, just northeast of Caddy Lake. It has no cottages on it and is not accessible by road, so we took the snowmobiles through the woods to get there. Firewood had been previously chopped and snow had already been piled up for the quinzee. You want to do this in advance so you don’t work up a sweat before sleeping in the quinzee. We got there around two in the afternoon. About six of us had sledded in, but only two of us were going to spend the night. We started off the day with ice fishing for walleyes. The walleye on this lake aren’t huge, but they are a perfect eater size. 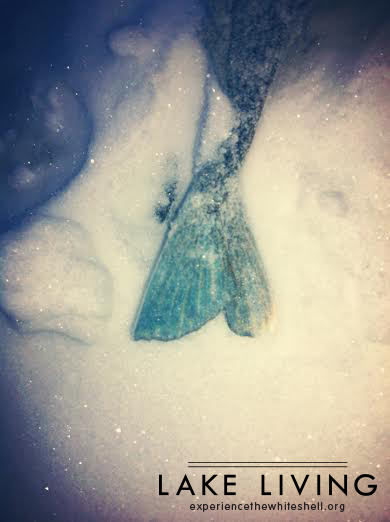 What is really interesting about the walleye on Caribou Lake is that they have blue fins! According to the fishing experts and zoologists I was with, this is most likely because of the water colour in the lake. Fish can vary in colour from lake-to-lake as the water colour varies. However I was told that apparently there is a certain type of blue walleye, but not found in these areas. A very blue tail on a walleye from Caribou Lake. After landing about five or six fish, we hollowed our the quinzee. The previous cold snap and massive amounts of snow had made it quite firm. 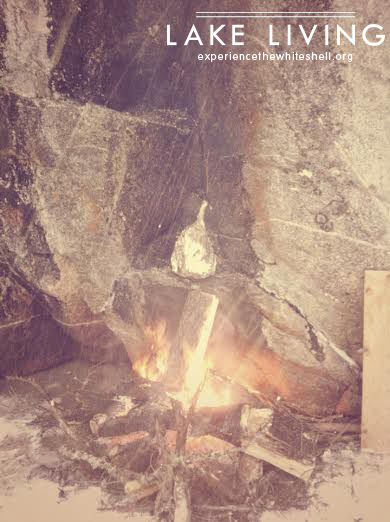 A large cliff with a little nook in it made the perfect natural spot for a fire as the rock cliff reflected heat back quite nicely. This was the perfect place to sit and keep warm throughout the evening, and it also was the perfect place to cook dinner. My boyfriend had brought a deer roast – An entire hind leg wrapped in tin foil. Low and behold, there was a little ledge in the side of the cliff right above the fire; a perfect place to cook the deer roast over the fire. It was a true caveman style dinner… Except we had injected our roast with garlic-infused olive oil. The deer roast cooked for over the fire for about five hours. To be honest, I wasn’t overly confident in the idea of cooking an entire roast on a rock by the fire, but it turned out to be the best deer meat I have ever had! The deer roast cooking over the fire. After dinner my boyfriend took the rest of the crew home on the snowmobile, giving me some time to myself in the woods. They took the remainders of the deer roast with them – And thank goodness. While I know wolves are highly, highly unlikely to approach a human, when you’re alone in the woods in the dark your mind can have a tendency to run away on you. The last thing I wanted was to be sitting there alone with a delicious garlic-infused deer roast! However I enjoyed the fire for awhile while the others were gone, and no wolves were seen. 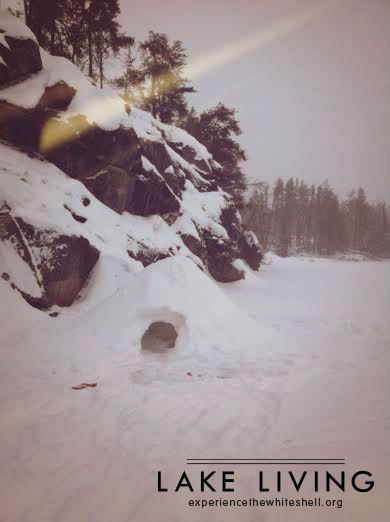 When it was the end of the evening, we rolled the snow door over the quinzee for a long winter’s nap. Well, it wasn’t that long. 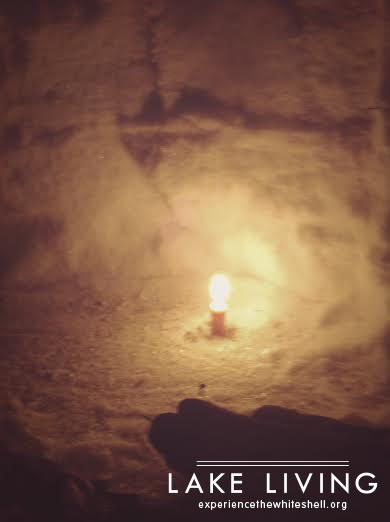 The quinzee was candlelit and actually created a lovely atmosphere, but our only mistake was that we should have layed down a tarp inside the quinzee to provide a bit more of a barrier between us and the ice. 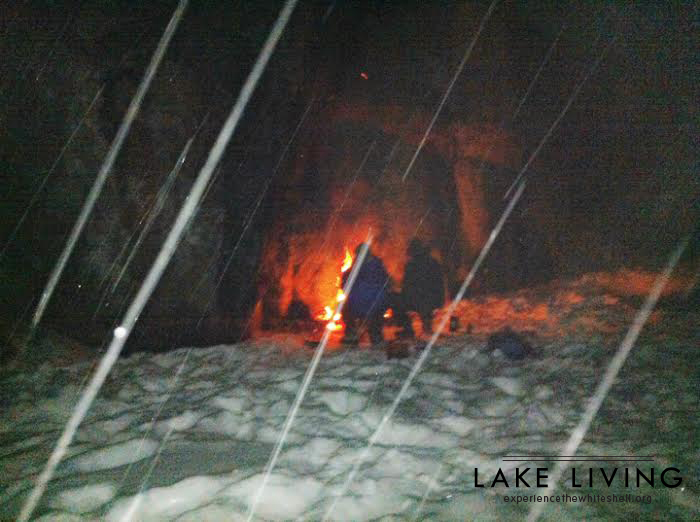 However the temperature outside was around -20C and the inside of the quinzee stayed at about zero degrees so we had a decent temperature to sleep in. This was a great experience and a true outdoor adventure. I would recommend anyone to give winter camping a try. If you come equipped properly it is an amazing experience and an awesome thing to check off the ol’ bucket list. 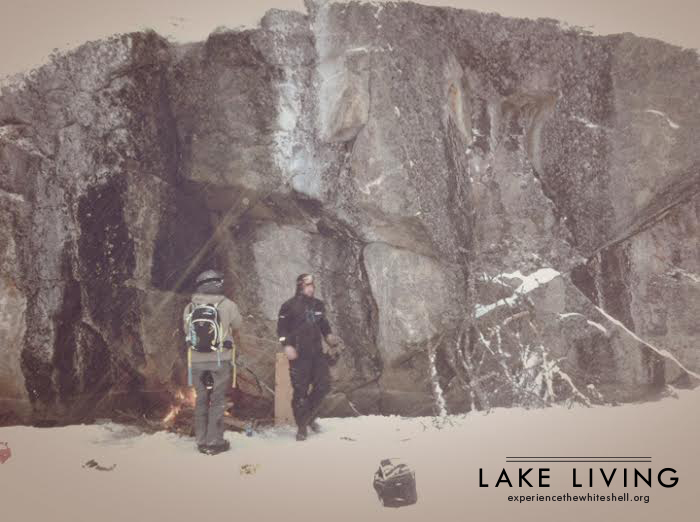 This entry was tagged Adventure, Caribou Lake, Deer Roast 101, Expedition, experience the whiteshell, Ice Fishing, Tourism, Walleye, whiteshell provincial park, Winter, Winter Camping. Bookmark the permalink.